Today is the world of multimedia. People all over the world make exciting videos to attract their audience. That is why making exciting videos is beneficial for almost all companies. Editing and merging clips are important to create high-quality videos. Different clips can be taken from different sources to form a complete, complete video. There are many software packages available that can be used to seamlessly and effectively merge the clips. One of these software packages is VideoProc. This is one of the most recommended software for merging videos with a whole range of video editing functions. With VideoProc you can Merge videos together in 4 steps many videos as you want without recoding. You can also cut and merge the videos. There is an option to remove unwanted parts from the videos. Using VideoProc, multiple audio/video tracks can also be combined as a single MKV file. Very high video processing speeds are represented by this specific software package. Here we will review the step-by-step guide to merge multiple videos with VideoProc. You must first open the VideoProc and then click on the “Video” icon on the main interface. You must then add videos by clicking on the “+ Video” icon. The different videos that you want to add must be selected one by one. The videos can also be dragged, placed in the desired area. You can also upload multiple videos at the same time by clicking on the “Video folder” icon. After the first step, the output format of the file must be selected. If the output settings are the same as those of the source files, the videos are combined without recoding. To enable the merge option, check the box with the name ‘Merge’ on the right. After the above steps, the “RUN” button must be pressed to perform video merging. Launch the VideoProc app on your Windows or Mac computer. Tap the “Video” button to get ready for video processing. Then click on the “+ Video” button or drag and drop the target 4K video (s) into the program. Convert H.264 to HEVC. Navigate to the “Video” tab on the bottom bar and choose “MP4 HEVC” profile to compress your video size by half or more. Tweak video parameters. Tap the “Codec Option” button to adjust video parameters such as 4K UHD down to 1080p/720p HD, change frame rate from 60 fps to 30 fps/24 fps, manually lower the bit rate or convert the 4: 3 to aspect ratio 16: 9. Cut off unwanted parts to reduce the video length. Click on the “Cut” button under video information. Drag the green buttons on the slider to select the first clip that you want to reserve and click the orange “Cut” button. Repeat this operation to select other required clips. Then click on ‘Done’. Split a long video into segments. Navigate to the “Toolbox” tab on the bottom bar, choose “Split” and double-click on it to access a new window. Specify how many segments you want to split your video with or how long each segment is. Click the “Done” button to complete. Click the “RUN” button to apply your changes and transcode your 4K UHD video to a smaller format. The built-in Auto Copy function and Hardware acceleration technology offer you up to 47 times the real-time higher speed for your video conversions. VideoProc costs $29.95 for a one-year license and $42.95 for a lifetime license. But of course, you can now download a trial version for free. It has limited options, but it gives you a good idea of what this product is about. Overall, The VideoProc interface is designed to be extremely simple and easy to learn. 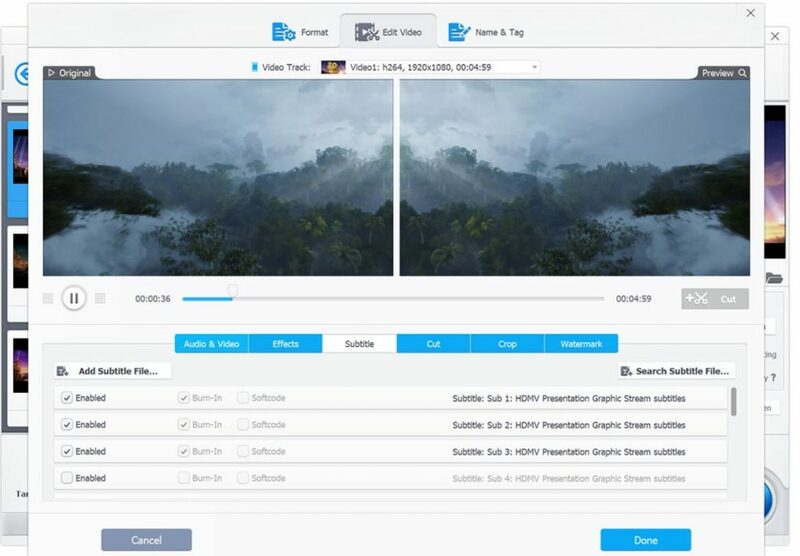 The learning curve is relatively low, but the complete guide on how to edit, cut, trim, merge, adjust videos, convert formats and compress 4K videos with VideoProc is readily available.